You can view fully translated Studio Help by clicking a link below, or use Google Translate (above) for more language options. Winshuttle Connect helps your company assign and manage licenses for Winshuttle products. You can use Winshuttle Connect to update your own information, change your Connect password, department information, and more. If you are a Winshuttle Administrator or User & License Administrator for your Connect site (see User roles and permissions), you can also assign licenses, add and manage users, and more. Click a link below to view the corresponding help section and topics. The home page displays an overview of current licenses, as well as system notifications and news from Winshuttle. You can also expand the Reports Dashboard to view a variety of reports. Manage and assign licenses, revoke licenses, change license assignments, manage server licenses, and more. Manage/add users. You can add individual users manually or import lists of users from a .CSV file. 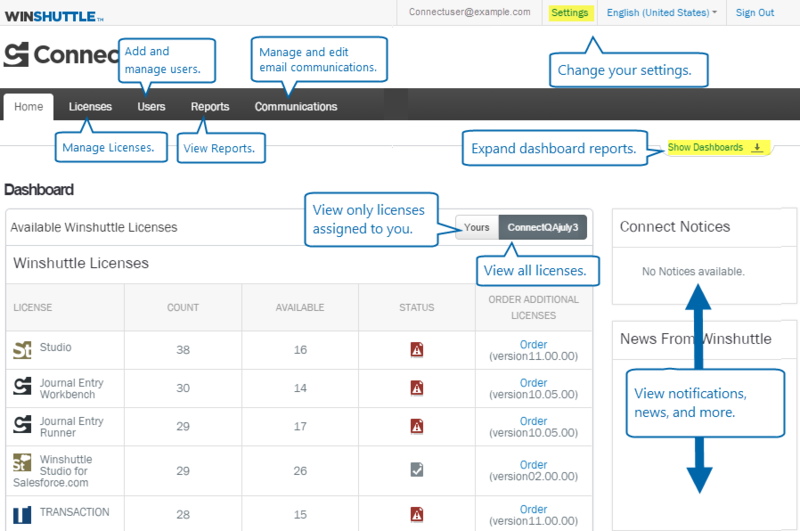 Create and view license usage reports. Manage email notifications or send requests for additional licenses (Administrators only). Change user settings such as contact information (phone, email, etc. ), company logo, and more. Sign out of Winshuttle Connect.